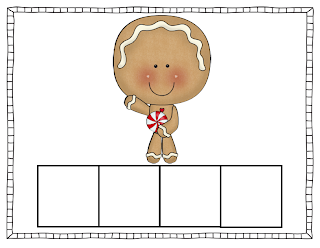 Quick Freebie + New Facebook Page! 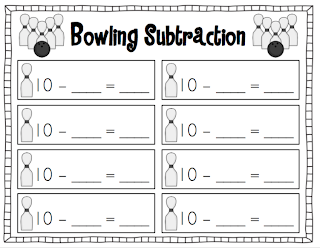 We've been working on subtraction this week, and I just whipped up this fun little game to use with my kiddos tomorrow. 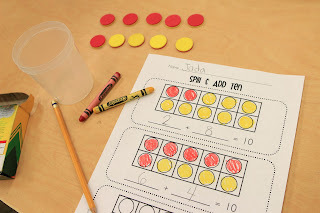 Once I introduce the game in whole group, it will be perfect for independent practice at math centers. If you have a mini bowling set, you can use the work mat to set the pins up on. Otherwise, you could just use a regular bowling set or even paper cups! Click the picture to download. PS - I just *attempted* to add a button to my new Facebook page. If you follow me on Facebook, you'll be sure to get up-to-the-minute info about all my freebies and sales! Let me know if you have any problems getting there! I'm currently working on a plant unit and some subtraction freebies, but I wanted to share something with you in the meantime! 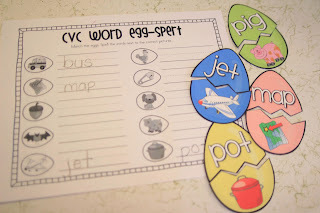 My kids this year have had a really hard time with sight words and segmenting, so I've come up with lots of different games and activities to use with my small groups. 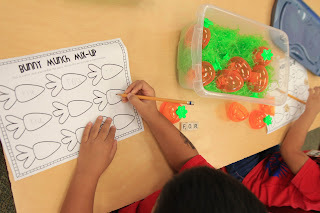 Here are some of the activities we've been having fun with lately! 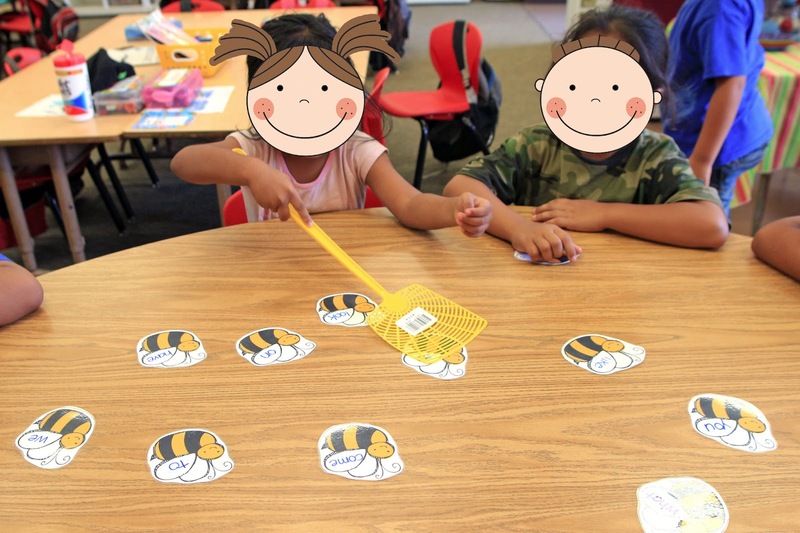 Just program the bees with your sight words (they're editable). 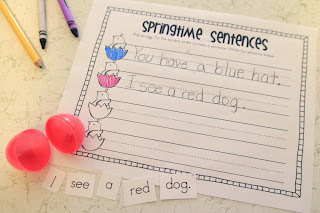 Call out a word and the student has to swat it. If they get it correct, they keep the bee! Click here to download the bees for Swat It! This game was inspired by Juggling with Kids. 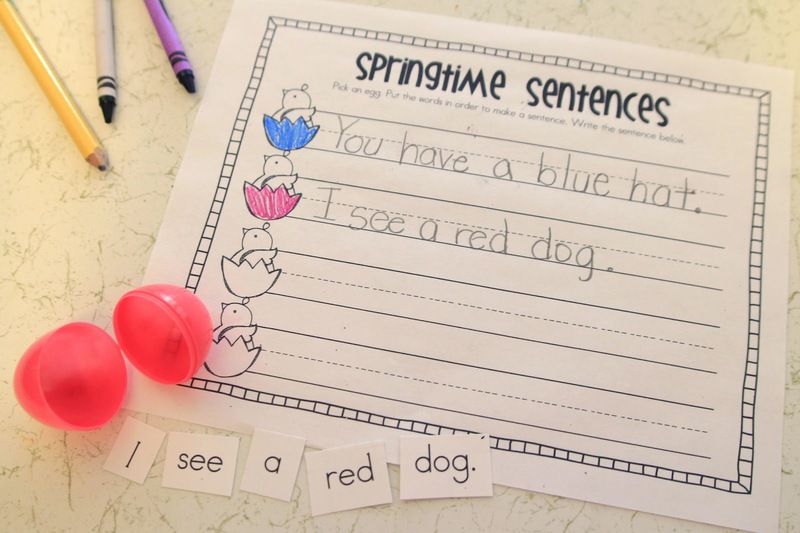 It's editable so you can program your sight words! 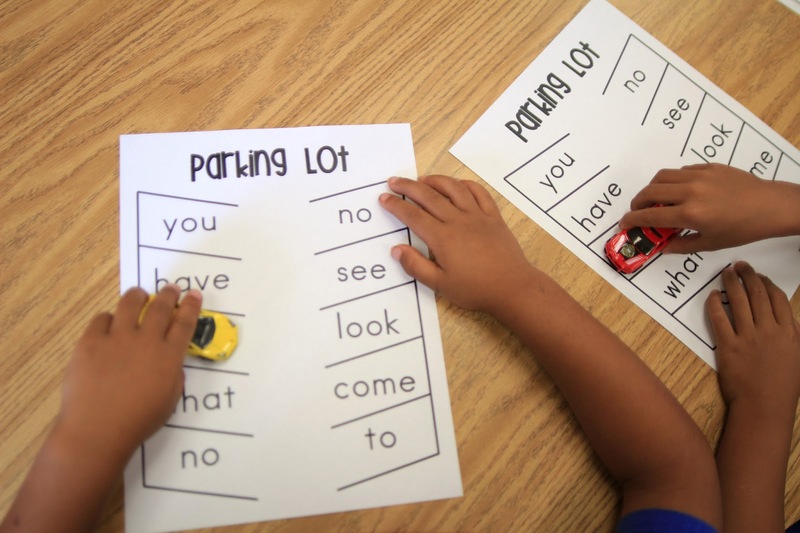 I call out a word, and the kids have to park their car on the correct word in the parking lot. 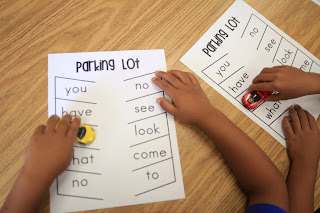 Click here to download Sight Word Parking Lot. Sorry I don't have a picture of this one. I simply wrote sight words on a beach ball. I toss or roll the ball to students and they have to read the word that is facing up when they catch it! 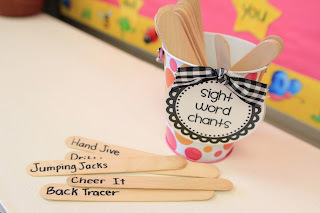 I found these fun chants at Growing Kinders! 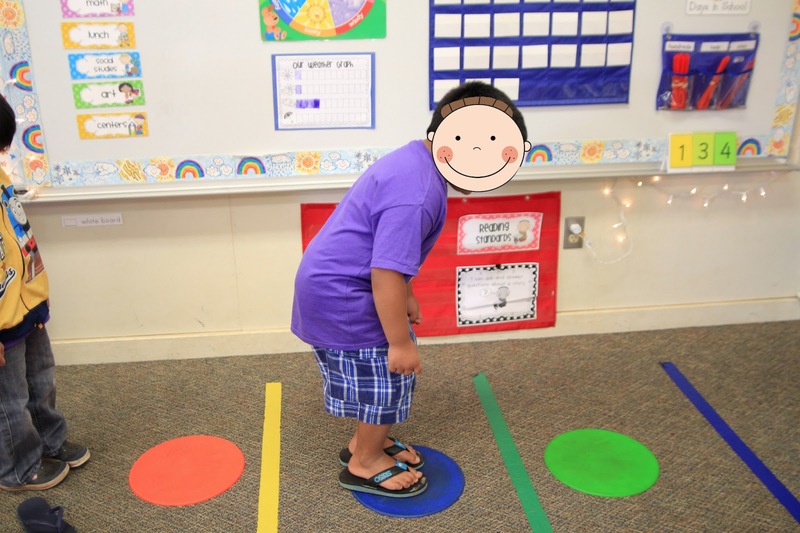 The kids love spelling their sight words while doing jumping jacks, dancing the disco, and more! 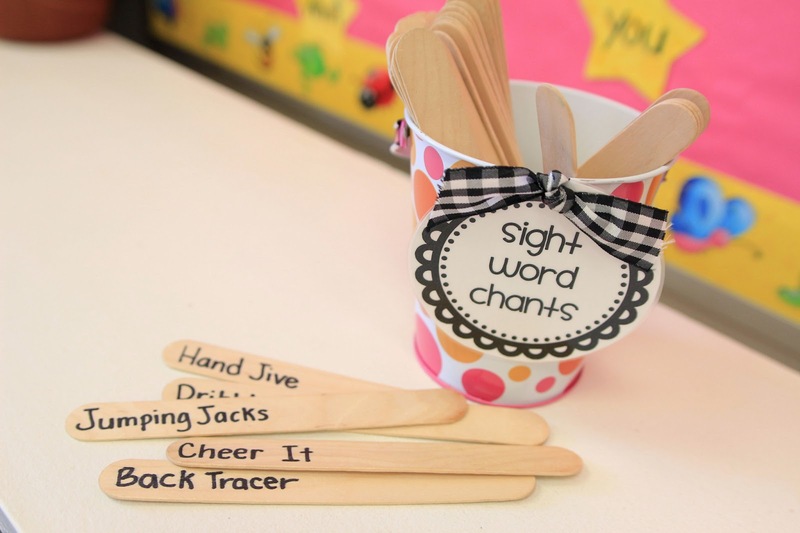 (I just wrote them on craft sticks and put them in a cup, instead of printing out all the labels). Here is the Label for the container. Similar to Bingo. 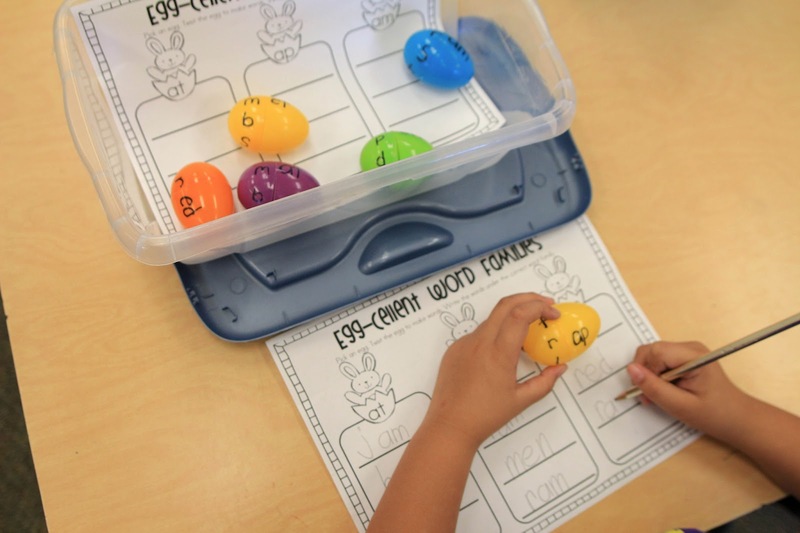 The children fill in the boxes with sight words of their choice. I call out words and they mark the word with a counter. First to get 3 or 4 in a row wins! 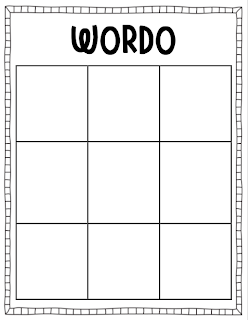 Click here for the WORDO boards. We use these rubber dots for hopping the sounds in words. 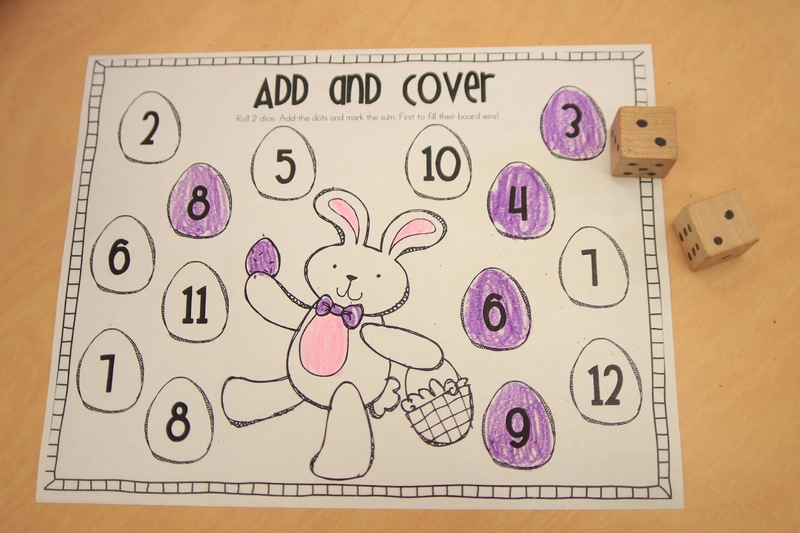 The children hop on a dot as they say each sound in the word. 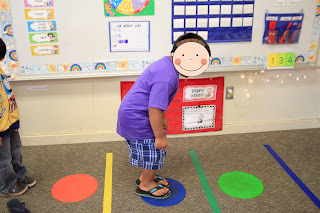 This is great for those kinesthetic learners! These cute tap lights can be found at Walmart for $1.00! I posted about these last year, but I'm posting them again because they are so much fun! 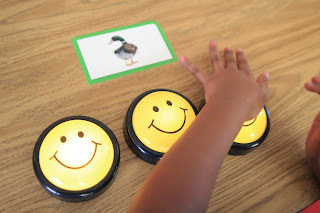 The kids pick an object or picture card and turn on each light as they say the sounds. 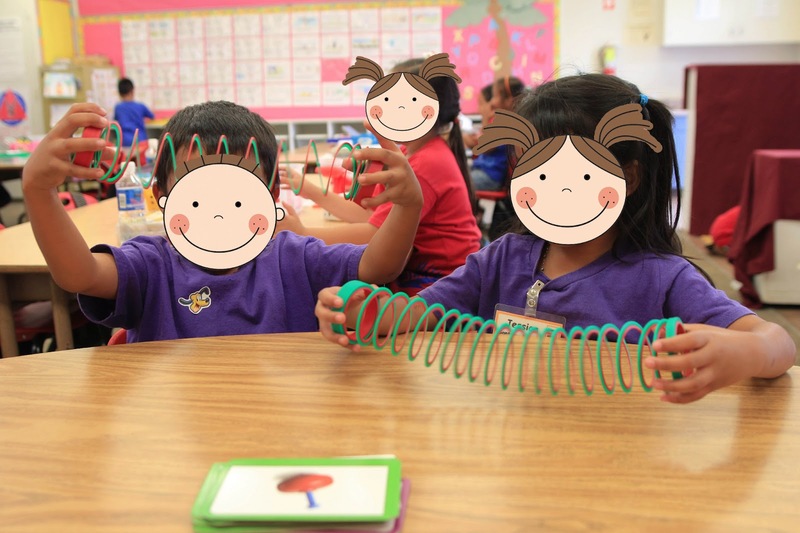 So simple and fun...we stretch out a slinky as we s-t-r-e-t-c-h the sounds in words! 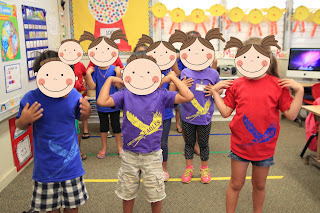 We tap our head for the beginning sound, shoulders for the middle sound, and so forth. 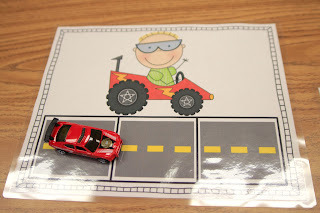 We use Hotwheels cars with these work mats to segment sounds! We roll the car slow as we say the sounds, then fast as we put them together and say the whole word. Click here to download my Race Car Segmenting. I made a variety of these Elkonin Mats to change things up a bit each month. 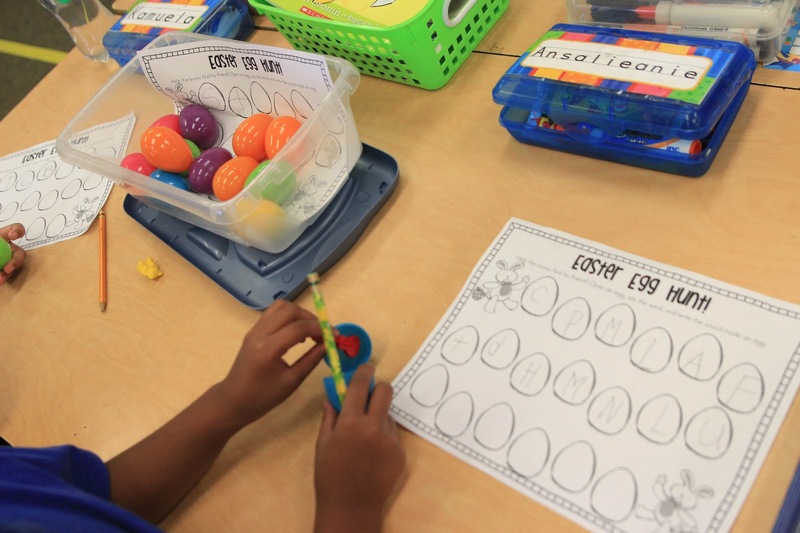 We use different manipulatives to go along with each theme. 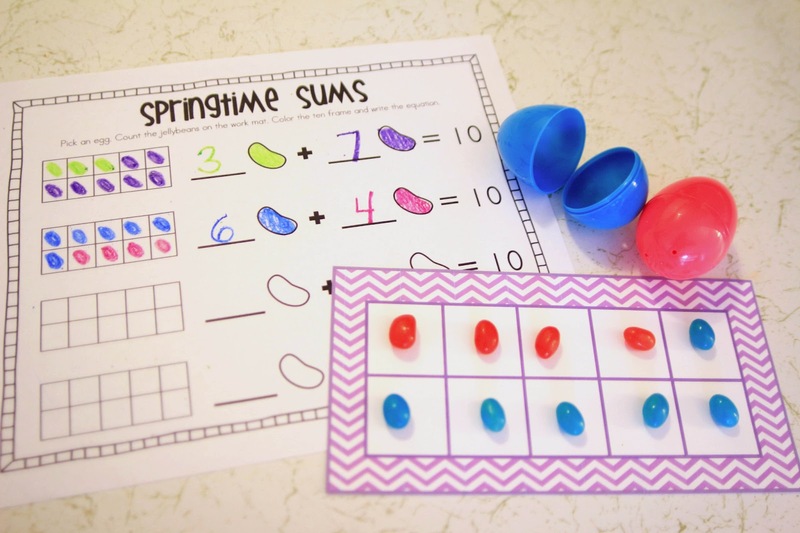 For example: candy corn in October, peppermints in December, cotton balls in January, candy hearts in February, gold coins in March, seashells in May, etc. 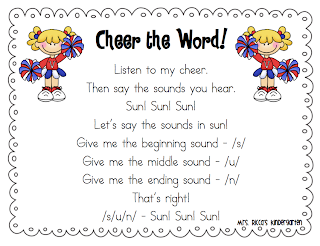 We love singing these Segmenting Songs. I found two of these in the book Phonemic Awareness Activities for Early Reading Success and the bumblebee song is based on the well-known name song. For the cheer, I found some cute pompoms at my local supermarket! 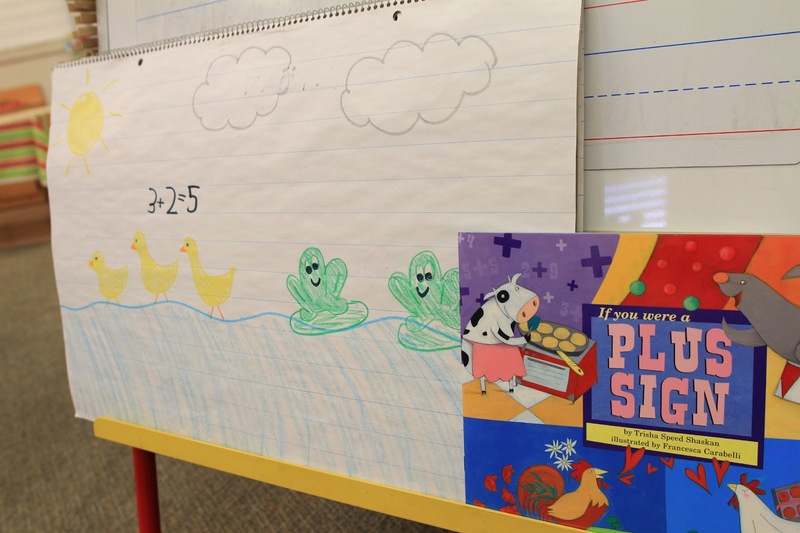 "If You Were a Plus Sign" features tons of cute addition stories in a variety of different contexts. 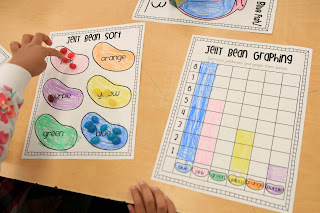 After reading, we made up our own addition stories and drew them on chart paper. The kids took turns telling the stories using words and then writing the number sentences. Then we made our own class book of addition stories! Click here for the Addition Story Template. 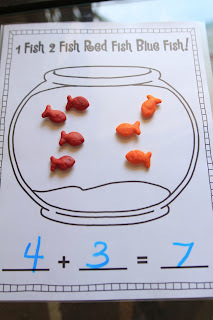 We read Animals on Board by Stuart Murphy, which features some simple animal addition stories. Then we used animal puppets to act out our own addition stories. While students acted out the stories, the rest of the class wrote the addition sentences on their white boards. 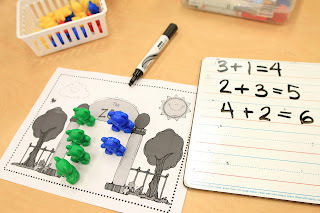 For independent practice, we used bear counters and zoo work mats to model addition problems. 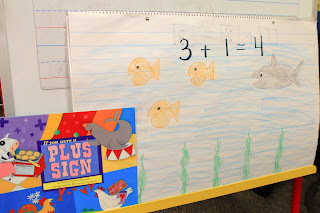 The next day, we used a felt board and animal props to model more addition stories. I just came up with this idea on the spot but the kids loved it! 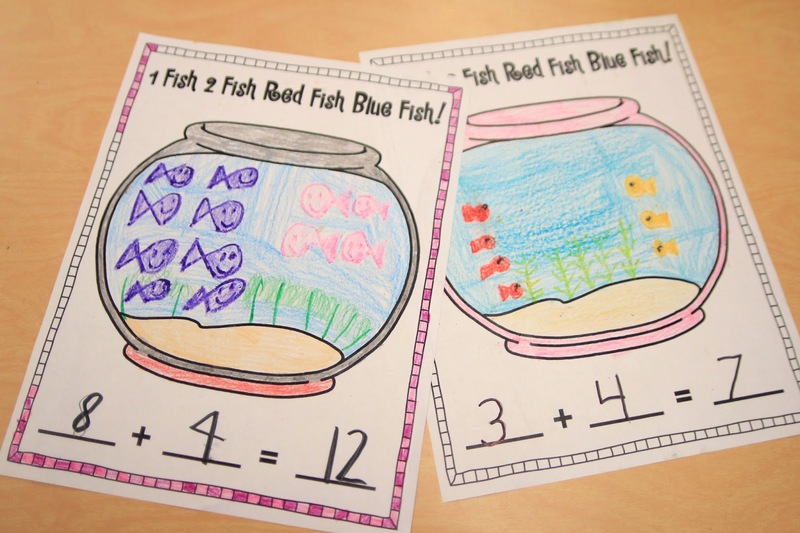 They took turns choosing animals, saying the addition story, and writing the equation. Then we did cut and paste addition stories from The Moffatt Girls! 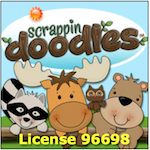 You have to check them out...they are super cute! We had so much fun with this one! 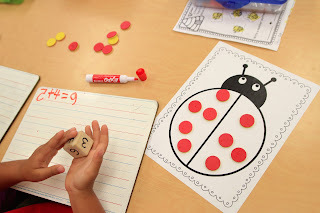 I made a simple ladybug work mat and the kids had to roll a die two times to see how many dots to place on each half of the ladybug. 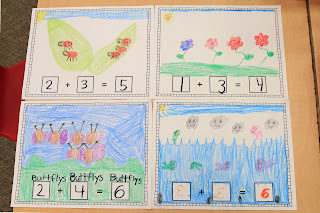 They recorded the number sentences on their white boards. Then we made a ladybug addition craft. 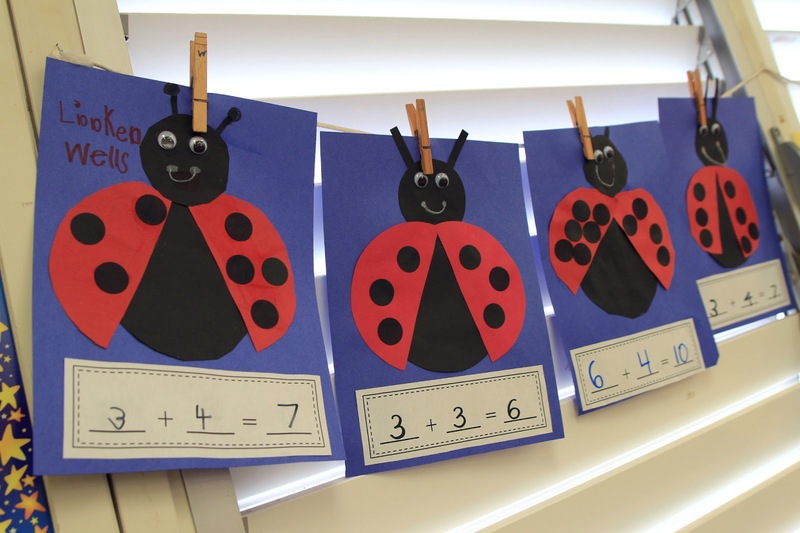 Didn't their little ladybugs turn out super cute?! Click here for the Ladybug Work Mat. 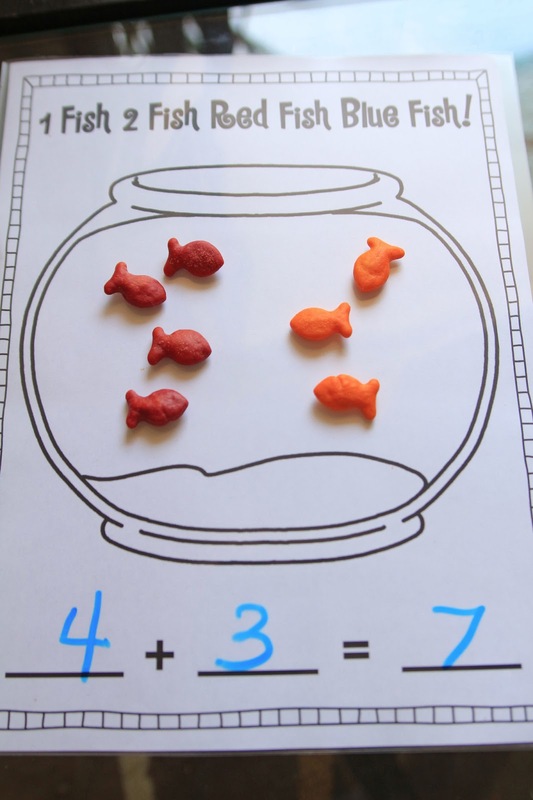 We read One Fish Two Fish Red Fish Blue Fish, then I brought out some Goldfish Crackers! 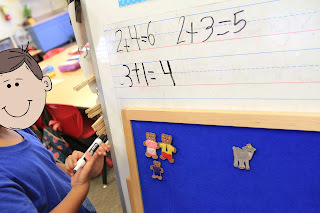 First, we used the crackers to model addition stories and write the equations. As an assessment, they had to draw an addition problem in the fish bowl. 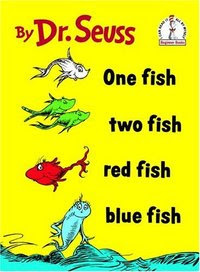 Click here for the Fish Addition Template. 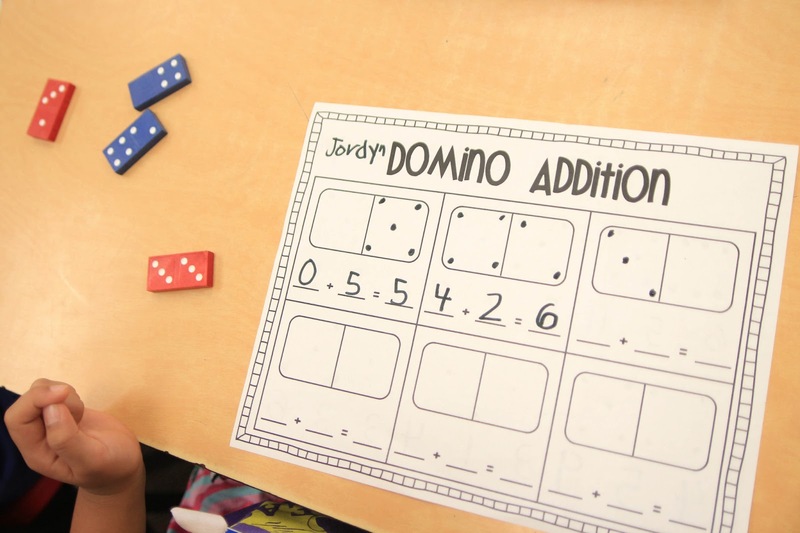 We read the book Domino Addition and practiced as a group using extra large dominoes. Then I put baskets of dominoes on all the tables. The kids had to choose a domino, draw the dots, and write the addition sentence. 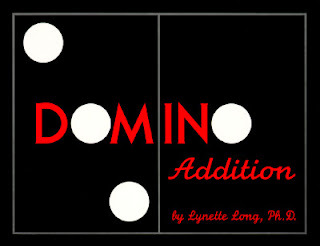 Click here for my Domino Addition Sheet. I made two versions of this one (5 and 10). 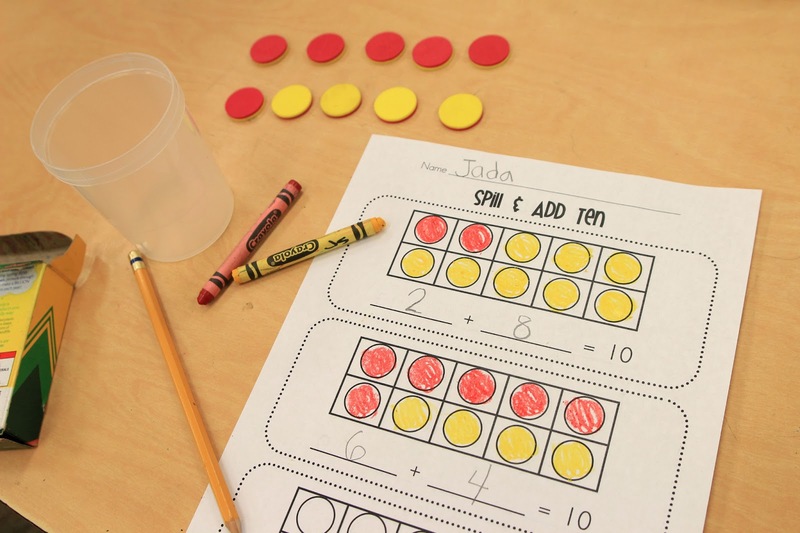 The kids shook up a cup of 2-color counters, colored the recording sheet, and wrote the number sentences. Click here for the Spill & Add Sheets. 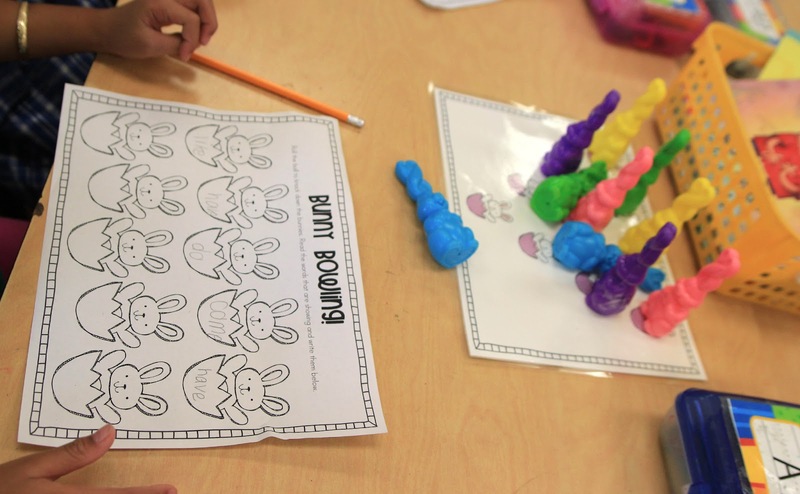 We read Benny's Pennies and then practiced decomposing number 5 with this super simple game. The kids shook up a cup of 5 pennies and drew H for heads and T for tails. 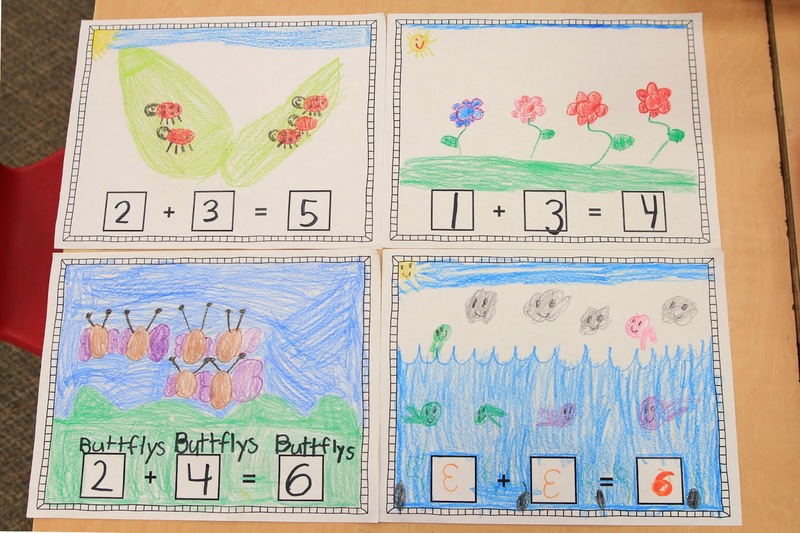 Then they wrote the number sentences. 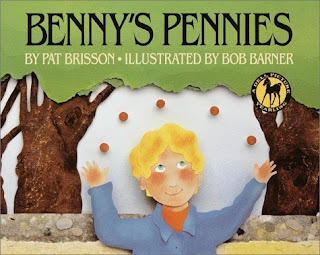 Click here for the Penny Toss Sheet. 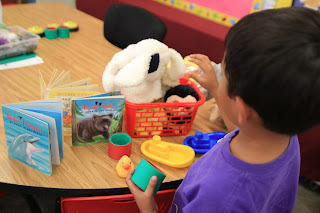 We pretended to go shopping at the toy store for this lesson! The kids took turns choosing two items from the store, and the class had to model the addition with pennies to show how much money they would need in their piggy bank to buy the toys. The "shopper" got to model the problem on the board with magnetic pennies. 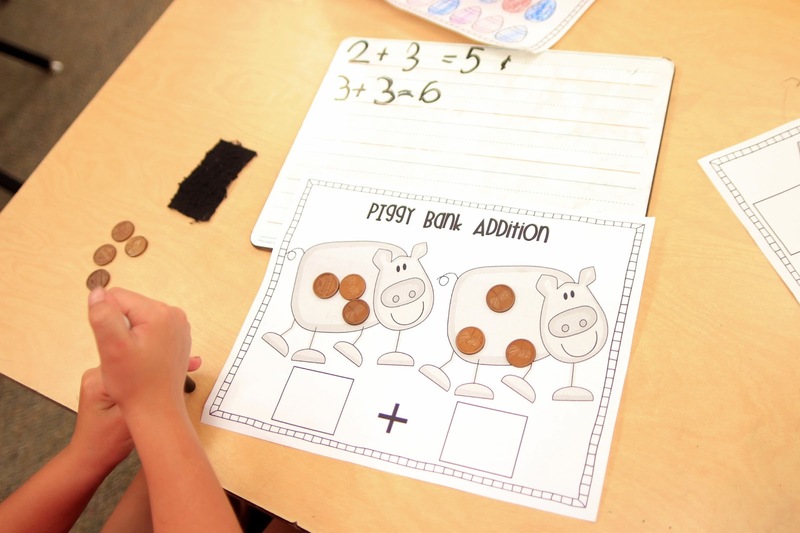 Click here for the Piggy Bank Addition Mat. 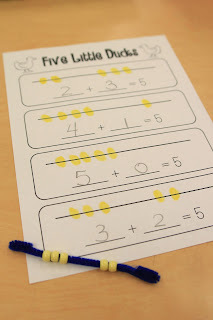 We sang Five Little Ducks and used fuzzy sticks and beads to decompose the number 5. 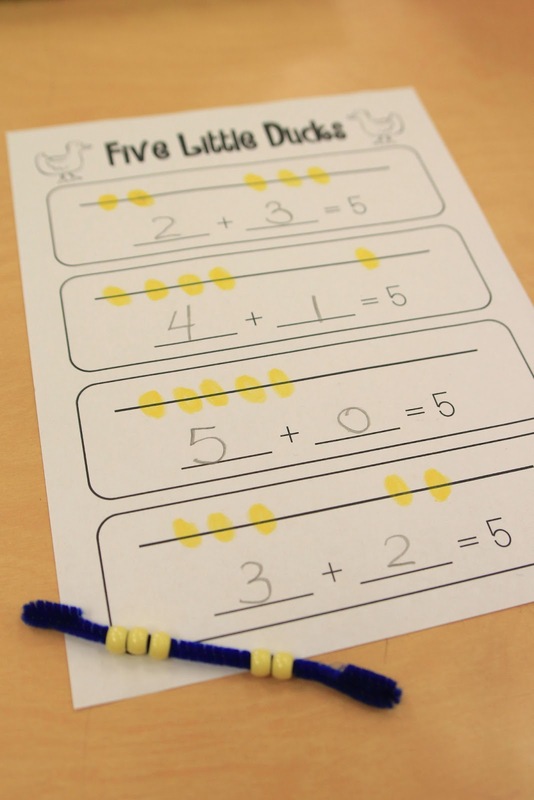 This idea was inspired by Deeanna at Golden Gang Kindergarten! She is sooo AWESOME! That's all for tonight! I hope you've found something you'll be able to use with your own class. Next up...subtraction!! Since we didn't have much time to enjoy Easter activities before spring break, we continued our Easter centers this week. Check out all the fun we had! These centers are part of my Easter Pack (see my previous post). 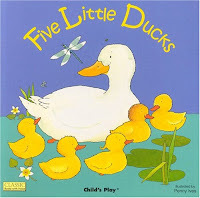 The idea for these cute chicks came from Simple as That. For the feathers, we traced our hands. 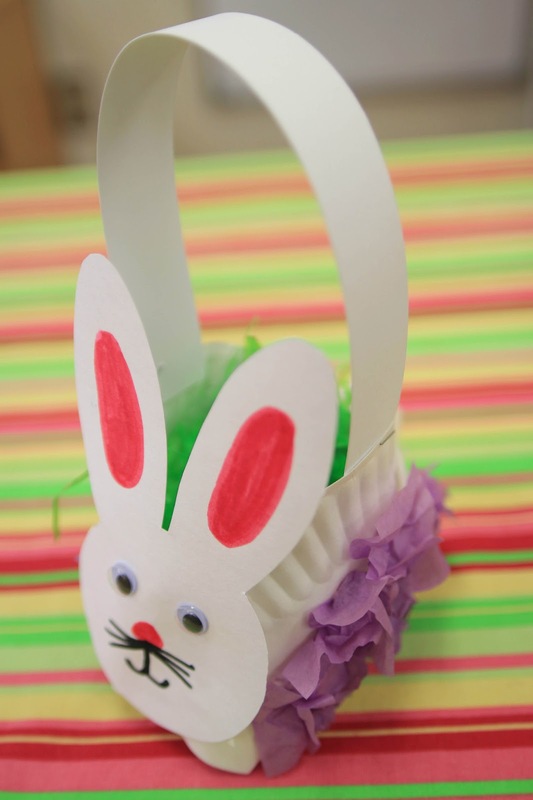 We made these bunny baskets out of a paper plate. Then we went on an Easter egg hunt!!! We had tons of fun this week! Check back in a few days for some math freebies! !